A boisterous bilingual board book that introduces littlies to colours with the help of Hairy Maclary and his friends! 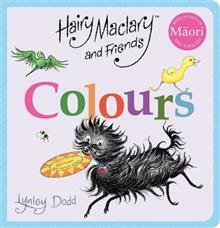 A gorgeous board book with pictures of Hairy Maclary, Scarface Claw and other favourite characters created by Lynley Dodd to teach children their colours in Maori... read full description below. A boisterous bilingual board book that introduces littlies to colours with the help of Hairy Maclary and his friends! A gorgeous board book with pictures of Hairy Maclary, Scarface Claw and other favourite characters created by Lynley Dodd to teach children their colours in Maori and English. This special little volume is perfect for the young learner and helps to incorporate te reo Maori into everyday life. Perfect for children ages 3 months to 3 years. Lynley Dodd is one of New Zealand's best known and best loved authors of children's books. In a career spanning four decades she has produced more than thirty original picture books (creating both the story and the illustrations) published around the world in multiple languages. In a recent review for The Sapling, New Zealand librarian and reviewer of children's books Simie Simpson wrote, Fostering a love of language since 1983, Hairy Maclary is almost compulsory reading for babies and toddlers. Reading the lovely Zachary Quack Minimonster and Wake Up, Bear, I was reminded at how delightful and clever Lynley Dodd's books are. They are full of joy and rhythm, relatable and perfectly pitched for their intended audience.